First, process the oats in the food processor until it turns into flour. Then add the beans and blend again. Add all the other ingredients except chocolate chips, and blend until smooth in creamy. Pulse the chocolate chips in the food processor to mix into the dough. You can also just stir them in. With a spoon, place the batter on the baking sheet. You don't have to worry about them being really spaced apart as these do not spread very much when baking. Bake for 18 - 20 minutes. Let cool before serving. Store them in the fridge in an airtight container or the freezer. They will last a week in the fridge, and much longer in the freezer. You can also use 1 heaping cup of dates instead of date sugar if you prefer. The cookies will be more gooey, and I recommend storing those in the freezer. If using dates sugar: they can be stored in the fridge for up to a week. 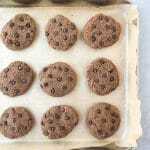 *To keep the cookies completely free of all sugars, use cacao nibs instead of chocolate chips.